The "all new Ford Anglia" 105E coasters. Homepage. 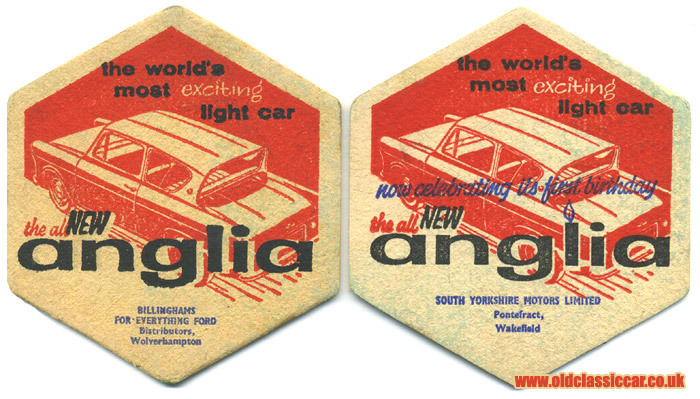 This page: Two 1960s' coasters / beermats both featuring Ford's 105E saloon when new, and at its first birthday. A little while back a coaster featuring a BMC 1800 turned up, and now this Ford duo have landed on the doormat. Both feature Ford's 105E Anglia saloon, one when it was first launched - in September 1959 - and the other, when it was one year old. The designs are virtually identical, other than the garage details being different, and the later coaster featuring a little extra text on it. The 1959 coaster was given out by Billingham's, a Ford distributor in Wolverhampton, whereas the later one hailed from South Yorkshire Motors Limited, of Pontefract. "The world's most exciting light car" we're told, and judging by its popularity throughout the 1960s maybe it was!? They're certainly a popular little car with Ford enthusiasts, and those that haven't succumbed to the almighty tinworm are quite sought-after. A 105E buyer's guide was added onto the site a little while ago, and various old photographs featuring 105Es, both standard and modified, appear here too. A quick check via the Site Search at the foot of the page will bring up all the 105E Anglia material, including for example a selection of period photographs on this page, and a heap of adverts in the free 105E classifieds section.